Special event planners — especially those in the nonprofit world — know that organizing an outdoor fundraising event is a great idea. These types of events, like other community fundraising ideas, require that planning for next year’s event begins immediately after this year’s fundraising event concludes. It’s important to debrief the event and discuss what went well and what could be improved upon while the event is still fresh in the team's minds. Discussing the successes and improvements ensure that those features may be included or enhanced for next year's event. Such proactive planning also adds value for the sponsors. And, inevitably, all successful community walks hope to grow and expand from year to year. It’s important to stay focused on the primary objective of holding such events: fundraising. For those event planners who have previously held a community walk, one of the most important times for planning actually happens after the walk ends. In order to learn about the many aspects of planning and executing a community fundraiser walk, we're going to get a behind-the-scenes look at the Mother's Day Event hosted by Chicago's Y-ME Breast Cancer Organization. Y-ME was founded by two breast cancer survivors in 1979. The non-profit was best known for its multilingual National Breast Cancer Hotline program for breast cancer patients. The program gained fame as the country’s only 24-hour toll-free hotline staffed entirely by breast cancer survivors who are trained peer counselors. But the organization also organized an annual fundraiser walk on Mother's Day, which supported their programs and services. 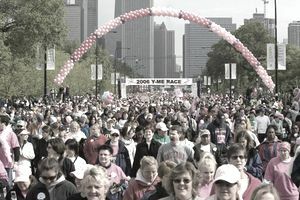 Back In 2007, Y-ME raised more than $7 million with nearly 43,000 walkers from 12 cities. By 2008, 15 cities participated. Unfortunately, Y-ME closed its doors in 2012, but the legacy of its annual fundraiser remains a great case study for nonprofit event planners. Much of Y-ME’s fundraising success can be attributed to an organized approach to planning and keep an eye on the most important objectives first. Liz Klug, the organization's former director of special events had this to say after their record year in 2007: “We have a plan for various points in time during the planning process. So, we will take steps to promote those most critical points in time to make sure we’re successful. For example, in a city where we may be hosting an event for the first time, we must focus on making sure we have a great venue and location where people will want to come back. Down the road, we can focus on which coffee shops we’ll drop off brochures.” Let's take a look at how Klug and the Y-ME event planning team organized such a successful event. Hosting a community walk or similar event requires bringing together several different constituent objectives, but ultimately, the association or charity hosting the event is doing so to raise money for their cause. Therefore, the first step in planning the next event happens when the current event ends, and most of that work surrounds the "numbers." “We looked closely at the numbers after the event concludes,” explains Klug, “We compared how we did this year versus the previous [year]. We looked at the participant experience. We evaluated our categories of sponsorship. We responded to any immediate e-mails about the events.” Event planners will also take immediate steps to assure all those involved in this year’s event will continue next year. Klug also dug down into the details. In her evaluations, she looked at everything from the number of volunteers who participated in the volume of t-shirts distributed. She would then ask whether she needed more or less for the next year. For those organizing a community fundraising walk, it’s important to know what steps should be handled at various times. Most nonprofits don’t have the luxury of many staff and volunteer committee members to drive the event’s success. But planners recognize that they must make sure that they work closely with a city’s mayor’s office and public works department to get the event on the public calendar. Y-ME would also hire an outside logistics firm to handle many of its logistical requirements. But one of the most helpful was implementing an online registration system. Y-ME quickly learned about the importance of using the web for online registration and has since strongly advocated for use of the technology for online registration and fundraising. They invested in an online constituent relationship management system to serve as their 2003 race website. This type of system serves as a personal website for volunteers to make personalized appeals for donations and other involvement. It captures information into a single database and serves as a tool for walking team captains to encourage their members. Online participants increased from 4,000 to 11,594. Online donations increased from 5,000 to 19,650. The Y-ME team believed that it contributed to reaching a $2.35 million goal, and as a bonus, the technology reduced administrative costs by about $20.000. Such a system can also serve as an important communications tool that allows an organization to follow up and continue to involve constituents beyond the race day itself. Community walks are most frequently scheduled in the morning. Depending on the complexity of signage and location, set up for the event may usually begin as early as a week prior to the event, with most activity happening a couple days prior to the walk. When Y-ME would be planning for their annual fundraising event, the team would typically try to limit the area where they held the walk so that it didn’t require a significant amount of resource time to execute certain operations tasks like shutting down streets. Their walk was generally non-competitive, so it also helps that they did not have to consider the requirements needed for a more competitive race environment. For those organizations interested in holding a community walk or run for the first time, Klug offers several suggestions that will help ensure a successful event. Start with warm leads, including well-connected volunteers, sponsors or large team. Define measurable outcomes. Evaluate competitor events in your city/location to identify their best practices and areas for improvement. Work with city mayor’s office and park districts to discuss the required permits and your event logistics: time, location, number of participants. Make sure you’re prepared for those meetings. Understand your budget and make sure you keep your operating expenses to 25-30% for a new event. Some charities will strive for 15-20% of total expenses. Secure sponsors to absorb 100% of the operating expenses of your event.